A short-necked, Giraffe-like creature stared at the edible leaves on the upper branches of a tree. Without a sufficiently long neck to access the food it will starve—and so out of necessity it's neck grew, the result of a one in a million mutation. This particular animal would survive to pass on its new genetic adaptation, while the other short-necked animals perished. This is a very big part of the story of evolution—one that is regularly seen on popular science programs—a kind of metaphorical short hand, saying essentially, that an animal that is poorly adapted to its environment won’t survive. Here are a few questions. Why didn't all of the short-necked animals simply become extinct? Why did any of the animals survive? According to evolutionary theory their shorter necks made them poorly adapted to their environment, insuring their extinction. More importantly, what mechanism caused the neck to grow? Random mutation, according to the best scientific thought, is the answer. The central idea appears to be that, given enough time anything is possible. I have worked out a beautifully simple, yet elegant equation to quantify its properties—one that is similar to Einstein’s E=mc2 –or what is known in physics as the mass-energy equivalence theory. I call it, [time + chance = sh*t happens]! 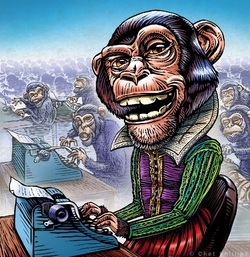 A variation on this idea is known as the "infinite monkey theorem," first stated by Emile Borel in 1913 as a thought experiment. An infinite number of monkeys, typing on an infinite number of typewriters, typing into infinity, could produce the complete works of William Shakespeare—better understood as, [infinity + probability + time = anything]. Simply put, given enough time, anything is possible. There are some fundamental problems with this idea, beginning with the concept of infinity. If the universe is infinitely old as Einstein believed it to be, we have the problem of infinite regress. It’s the chicken and the egg conundrum all over again—an infinite regression of problems that continues to move backwards infinitely without a first cause. The way in which atheists deal with this difficulty is by stating that, if God is the first cause of all things, then what caused God—if it’s possible for God to exist eternally, why not the universe? Does the problem of chickens and eggs apply only to physical things, as in the material universe? Plato, Aristotle and Thomas Aquinas understood the problem as the cosmological argument, of which only Aquinas was a true theist, arguing on behalf of religious faith. For the Ancient Greeks like Plato, it was an unavoidable conclusion—God, whatever it might be, must exist as the first cause, the uncaused cause! Does the problem of causes apply only to physical reality? Was there something before time, matter and space? Such is the problem of absolute origins within the boundaries of the laws of physics. There is, however, a place where even the laws that govern the physical universe break down—at the quantum level. Quanta are very tiny particles, which appear to be indifferent to the laws of physics. A single quantum particle can be in multiple places at once—not its twin mind you, but the same particle. This would be the equivalent of you standing in a bar in Cleveland while simultaneously standing in a completely different one in Botswana more than a continent away. Einstein, who was influential in forming the basis of the theory, rejected Quantum mechanics as a “red headed step child”—saying that, “God does not play dice with the cosmos.” For Einstein, the problem appeared to be, if the theory were true, then anything was possible. Why shouldn’t the earth just fly off of its axis and into the sun! Or why, when standing in a grocery store, aren’t we suddenly teleported to the depths of the ocean or a crater on the moon? Quantum mechanics forces us to reevaluate our understanding of the limits of the laws of physics. It also suggests that, contrary to our most cherished scientific observations, anything may be possible! 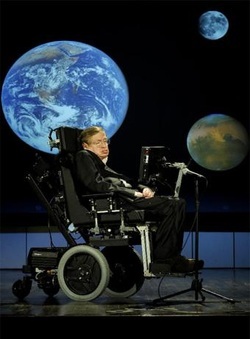 Stephen Hawking, in his latest book, The Grand Design, says,” Spontaneous creation is the reason there is something rather than nothing, why we exist.“ Hawking is suggesting that the universe spontaneously created itself—out of nothing. Or a universe that doesn’t exist somehow willed itself into existence. This would be like you giving birth to yourself. If you don’t already exist how do you give birth to anything? Even Quantum mechanics can’t reasonably open that door! This idea is as logically incoherent as anything articulated by religious fundamentalists and is a very real problem for science. Nothing can’t produce something, nor is it observably true anywhere in the universe. 0 + 0 always = 0, no matter how fancy the math. Modern science acknowledges that the probability of the universe emerging from nothing and then evolving into the extraordinarily complex form that it has taken is effectively zero! One of the ways of dealing with this problem is found in the theory of multiple universes. If there are billions of universes, sheer numbers could potentially make anything possible—the mysterious problem of the infinite monkeys rears its head once again—as does the problem of infinite regress, kicking the can ever further down the road in the hopes that the problem of origins will disappear from sight! I considered using this approach to problem solving at my local bank. “If I’m overdrawn in my bank account in this universe, but, I’m a wealthy man in another, does that count?” The bank manager using his own more earthbound form of math isn’t likely to buy it. Why does anyone? Too often it’s because some very smart men, the new regnant high priests of our intellectual culture say so—making it easy to lead people wherever they wish to be led. If you have no idea what the truth might be, then anything can be true! Once you move beyond the complex language of science and the elevated rhetoric that accompanies it, many of these theories are unimpressive, to say the least. However, none of this is intended to diminish Darwin's basic theory, Quantum Mechanics or the accomplishments of some of our greatest minds, like Hawking or Einstein. It is only to suggest that some ideas have been extrapolated well beyond the evidence—a tendency that both religion and science share. For the new militant atheists like Christopher Hitchens or Richard Dawkins, religion is the problem. If religion is nothing more than a human construct as they suggest, then religion, like so much unproven science, is not the problem—human nature itself is! Things evolve, that is certain; however, they appear to be bound by observable genetic limitations that are inherent to all species. All living and even non-living things change and adapt as environments change. But there is precious little evidence that an animal that is essentially land dwelling, like "Ambulocetus," a prehistoric crocodile-like creature that lived fifty million years ago, could become a mammal that is solely adapted to ocean life, like a whale. Because they share a few limited traits, such as teeth, is insufficient evidence to link the two together in any plausible way. If it did make such an extraordinary leap purely as the result of random mutation, did it happen all at once? This would be the equivalent of a child’s wagon randomly mutating into a space shuttle—an idea so ridiculous as to be laughable. If it did happen over millions of years there should be substantial evidence in the fossil record—and the fossil record in that regard is remarkably silent! In the video below, David Berlinski, a post-doctoral fellow in molecular biology and mathematics, suggests that there would have to be at least fifty thousand major biological changes in an animal like Ambulocetis to allow it to survive in the ocean. Changes that would all have to occur simultaneously, not gradually over millions of years as Darwin's theory suggests. This is known as "punctuated equilibrium", a theory first developed by Niles Eldredge and Stephen J. Gould. I’m forced by this revelation to recalibrate my elegant little equation to something more like, “when sh*t happens, it can happen very quickly”! This is just the tip of the iceberg regarding macro evolution, better understood as large evolutionary leaps allowing one species to change into a completely different one. For that, the fossil record has more than gaps, it has boundless chasms. Darwin’s theory was and still is brilliant; he is not the enemy of religion, in particular Christianity, as many Christians are prone to believe. He observed and articulated one of the great truths of science–things change and adapt over time, those organisms that are best suited to their environment survive to pass on their genes to succeeding generations. The Biblical creation narrative poses problems only if we read it absolutely literally. So much of the early chapters of Genesis are filled with very obvious symbolism—talking snakes, fruit with the powers of knowledge and life and death. If one accepts that the account in Genesis is more metaphorical than literal it becomes obvious that when God speaks and the universe comes into being is a way of saying that the Hebrew God was a God of reason and his creation was the Logos, meaning the “word” that bore his image, reflecting the reason of God! Yahweh (God) didn’t create using manual labor, as was the vision some cultures had of their deities—for the Hebrews, God was knowable and by extension so was the universe—a foundational principle in the evolution of the scientific method. One of the major problems with mainstream Christian thought regarding such difficulties is the inability or unwillingness to read the Bible with some historical context. Instead, we tend to see it primarily as a mystical book, disconnected from any observable reality. Stating that all things are possible with God is not a license to allow our imaginations to run free, minus any reasonable basis for our beliefs. If God did create the world as the Bible says, then the laws of nature are His laws—and they reflect His nature and intent. Foolishness doesn’t become logic simply because it’s consistent with our deepest convictions. St. Augustine, (354 A.D. – 430 A.D.), understood that the Bible was filled with symbolic language as well as different literary forms, comprised of history, wisdom literature, epic poetry and legal or legislative books—not all of which was intended to be understood literally. Great Christian thinkers like Thomas Aquinas, (1225 to 1274 A.D.) and C.S. Lewis (1898 to 1963 A.D.), perhaps the 20th century's greatest Christian philosopher, understood this as well. Jesus himself seldom ever spoke literally, but chose stories, parables and metaphors as his primary method of teaching. There is, however, strong evidence that the universe had a beginning, what scientists call the big bang—somehow, someway, everything, including time, space and matter, just appeared out of nothing. Before there were laws of nature or a nature to be governed, there was something that was not a part of the universe—but its cause. According to science, that something was non-material, outside of time and space and a thing of absolutely unimaginable power. This sounds an awful lot like “In the beginning” from the Book of Genesis—and like no other known religious tradition. But before we shout, “Hallelujah, praise the Lord,” Christians still have the problem of talking snakes and magical fruit to deal with. Such literalism was a problem in Jesus’ time and still is today. For secularists, it is likewise true that, before you reject what sounds like nonsense in an ancient document, you must look at your own use of metaphor and remember that animals don't just grow longer necks because they need to and [time + chance = sh*t happens] is no more compelling than believing God created the universe in six literal days. Both sides are seeking the truth and an opposing opinion isn't always heresy, whether scientific or religious!